There is a lot of work that goes into getting your drivers license. You have to be able to follow the rules of the road while also understanding the reasoning behind those rules. During your road test, you could be automatically disqualified from getting your license if you go even slightly above the speed limit or if you make a turn at a red light when you are not allowed to. What can you do to ensure that your road test goes smoothly? The only way to learn how to drive a car is to spend time driving a car. Ask your parents, grandparents or anyone over the age of 21 to take you driving whenever possible. On your first few trips, you should limit yourself to driving on familiar roads in good driving conditions. As you start to feel more comfortable behind the wheel, you can then start to drive when it is snowing out or when the roads are icy. There are several maneuvers that you will have to execute while taking your test. Typically, you will need to prove your ability to make a three-point turn as well as your ability to parallel park. For many drivers, parallel parking is the most difficult part of the test. This means that you should practice this maneuver as often as possible. The good news is that you will most likely only have to parallel park behind one car as opposed to having to fit in between two cars. It is important to feel comfortable in the car that you are taking your road test in. If you have been practicing in a compact car that has an automatic transmission, you won’t be prepared to take your test driving a SUV with a manual transmission. Changing cars makes it harder to judge the amount of room you have while executing the required maneuvers on the road. Spend some time driving down the same roads that you will take during your road test. This will allow you to become familiar with the road signs, speed limit and any other obstacles that you will have to overcome while taking your test. The instructor who is grading your test will expect you to follow the letter of the law. This means that you have to put on your turn signal during your parallel parking and three-point turn. You will also have to stay exactly at or below the posted speed limit. In other words, you will have to drive at exactly 35 miles per hour if that is what the speed limit for the road you are on. Driving instructors have been known to deduct points from drivers doing as little as half a mile per hour over the speed limit. Drivers also need to be able to follow road signs regardless of what the driving instructor tells you. For example, if you are told to go left, but there is a sign prohibiting a left hand turn, you have to continue going straight. Your parents may not be the best drivers in the world. They may not know all of the rules of the road that you will have to memorize when taking your road test. However, a certified driving instructor can teach you the proper way to drive to stay safe and pass your test. Teenage drivers who take a driver education class may be eligible for their unrestricted license before they turn 18. 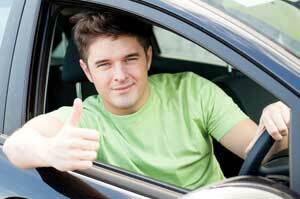 Insurance companies are also known to give discounts to drivers who complete their course. Passing a road test takes a lot of preparation. You have to prove to the person in the car with you that you are ready to get your license. To increase the odds of passing your test, use one car throughout the training and testing process, take time to drive on the roads that you will be tested on and take classes from a certified driving instructor. Following these steps will help adequately prepare for and pass your driving test the first time that you take it.